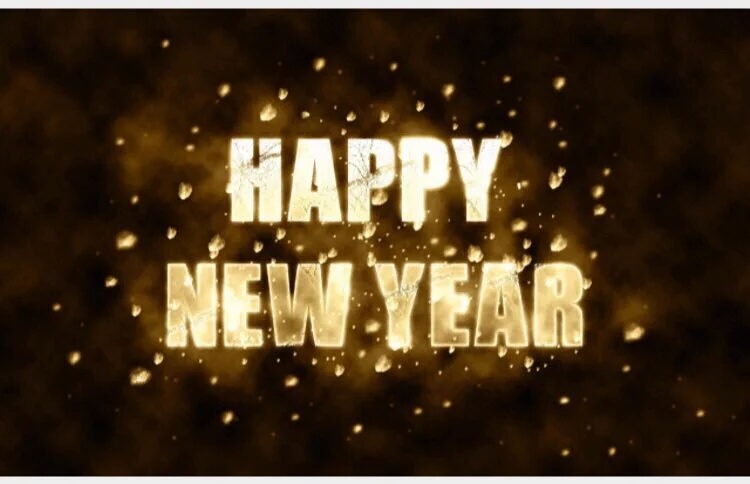 Happy New Year everyone and welcome to 2016! To start our first post for this year we would like to say thank you to everyone who has helped make this blog happen. Whether you have contributed to our blog writing as a guest of the week, followed our twitter account or regularly read our articles, we say thank you! Expect the articles this year to be even better! 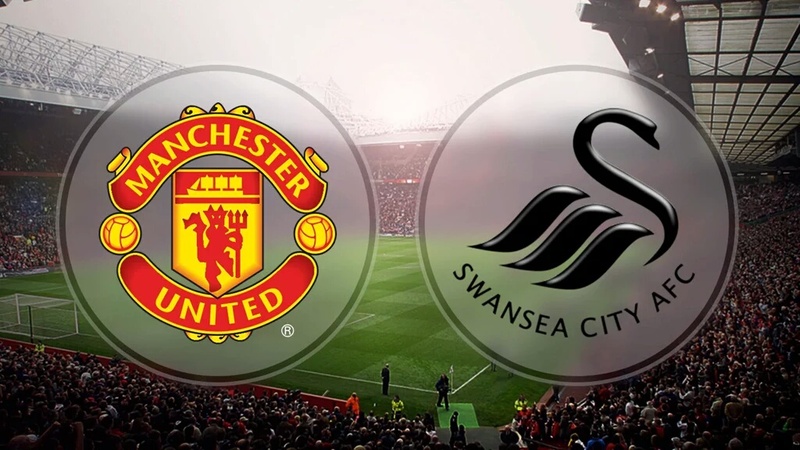 After a hectic bunch of festive fixtures, the first game for the new year for United sees us take on Swansea. Now you do not need to have a PhD to know that for some reason we always seem to struggle against Swansea. You might call us too optimistic but since its a new year, the improved performance against Chelsea and the ongoing pressure on the manager and the team, we believe that the Red Devils can get a victory against the Welsh side. Having played 19 games so far and half way through the season, United are currently in 6th place and are lying 5 points behind 4th placed Tottenham (yes, it does say Tottenham) and 9 points behind league leaders Arsenal. We are winless in 8 games and have a manager whose future is under uncertainty. We really do need a win to try and get back on track. The month of January can be summed up with 2 words: transfer window. Undoubtedly, our team definitely needs new reinforcements if we are serious about challenging for this title this season but more importantly given our current position, getting a Champions league place. Looking at our squad, we do have a good depth of players but at least one new defender, midfielder and striker will do. We definitely need a new attacking player since we have lacked quality in the final third. Today's game against Swansea is a must win. We were dominant against Chelsea last week but did not have the quality to win the game. 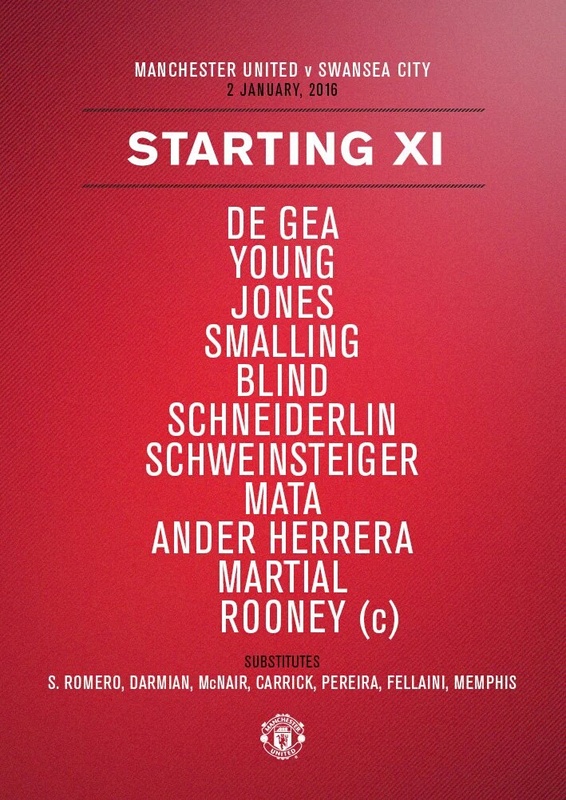 LVG will most likely keep the starting 11 more or less the same. 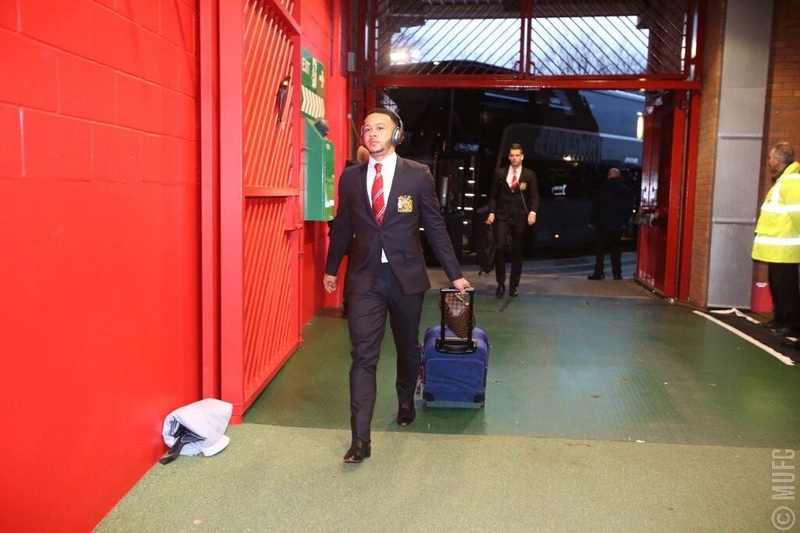 We will probably be without Lingard who is suffering from his hamstring injury and we are still without Valencia, Shaw and Rojo. For our team selection, I would keep the exact same starting 11 as last week who were: De Gea, Young, Smalling, Blind, Darmian, Schneiderlin, Schweinsteiger, Mata, Herrera, Martial and Rooney. The team as a whole is talented and is capable of winning matches but everyone needs to step up and show why they deserve to play for such a great team like United. Standout performances from that match were De Gea who made some brilliant saves and Young for his overall play. Swansea are 17th in the table with 19 points. I do not see them going down or finishing with a relegation battle although they do need to sort themselves out quickly. After sacking manager Gary Monk, they are being led by caretaker boss Alan Curtis. In their last game they drew 0-0 against Crystal Palace. We know that Swansea always relish playing against us because they know that they are definitely capable of beating us as they have shown numerous times. In the reverse fixture they beat us 2-1 in August so will be confident heading into the match. We know just how dangerous they are with the likes of Shelvey, Ayew, Sigurdsson and Gomis. 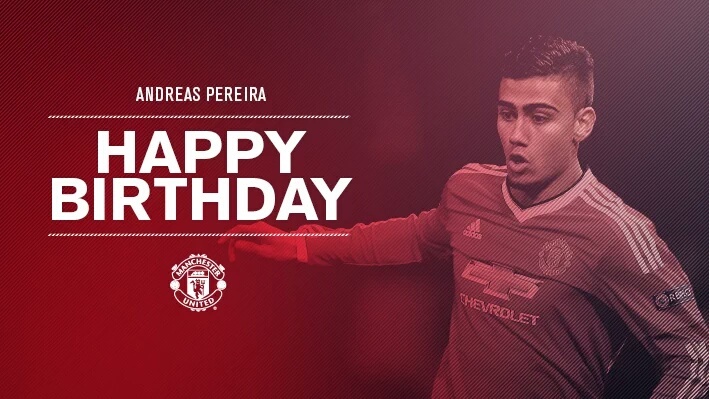 Just quickly we'd like to wish Andreas Pereira a happy birthday! The young talent turned 20 yesterday and it would be great to see him get some game time today. This lad has got a bright future, as we can see from his stand out performances for the U21 league, and the Brazil U23 team. 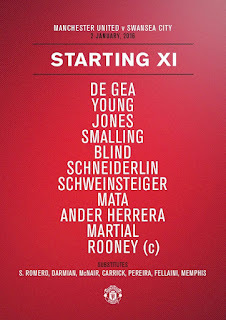 There is only one change from the team that drew 0-0 to Chelsea, with Darmian being replaced by Phil Jones. Our back line consists of Young and Blind as full backs, and Smalling and Jones as centre backs. Bringing Phil Jones in is an interesting decision by Van Gaal as Jones is a slightly reckless defender. However, Darmain hasn't been in good form recently, so maybe its time to give him a break. Our midfield consists of Schweinsteiger, Schneiderlin and Mata or Herrera. Our Schmidfield will be hoping to get into similar form to how they were earlier in the season. Mata will be eager to put in a good performance after his dreadful goalless streak. Ander Herrera will be wanting to show Van Gaal what he's been missing out on by not playing him. 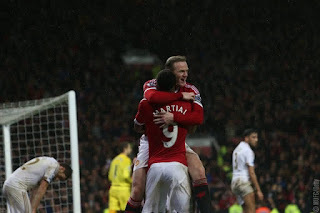 Our two strikers are Martial, who might play on the wing, and Wayne Rooney, who played well against Chelsea on Monday. Wayne Rooney will be hoping to start 2016 off with a goal or two after a poor goal-scoring record in the last few years. 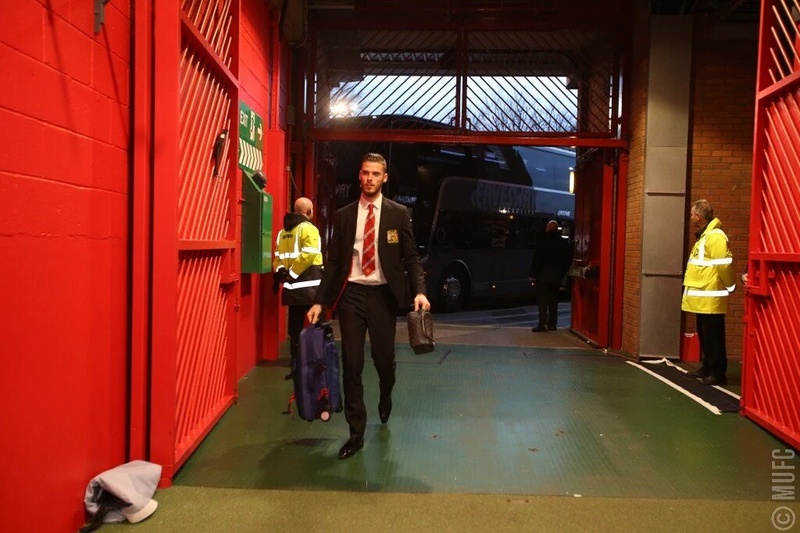 Another disappointing first half performance from Van Gaal's men at Old Trafford. It's goalless at the break with Juan Mata and Wayne Rooney having the majority of the chances for the reds. We started with some great attacking play, and we managed to apply pressure to the Swans from the off. Our first big chance came in the opening second with Ander Herrera making a magnificent run through the centre of the pitch. His shot was blocked by a Swansea defender. This was a sign of good things to come for us, but it's a shame that we couldn't maintain that attacking momentum. Throughout the entire first half, Ashley Young was causing havoc for the Swansea left back. 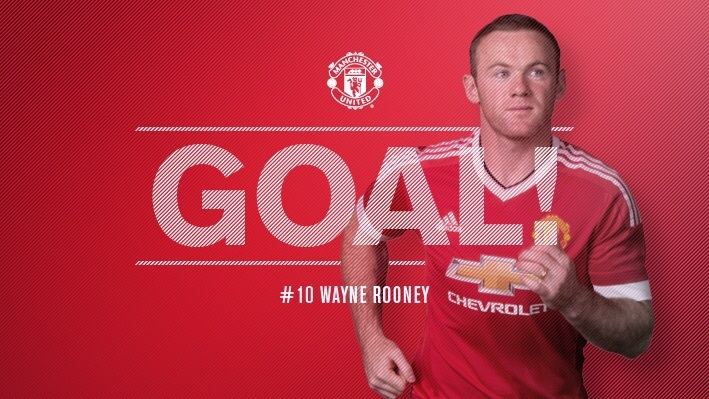 He was continuously making runs down the right wing and floating in perfect crosses to Wayne Rooney. However, he is playing in right back, and his attacking mentality makes us vulnerable at the back to counter attacks. Our two wingers, Martial and Mata put in decent performances. Martial, with his neat footwork, was cutting in a lot and attempting to get his shot away. But, in the second half, I think he needs to look up more and see if the better choice would be to pass the ball. 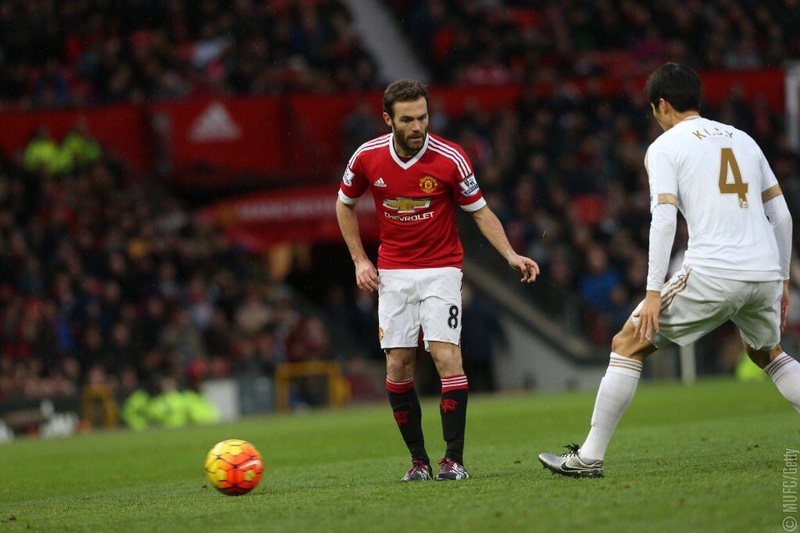 Juan Mata is showing intent to score, and to make an influence on the game. He's had a few good chances, but has failed to hit the back of the net. Wayne Rooney has had a good first half. 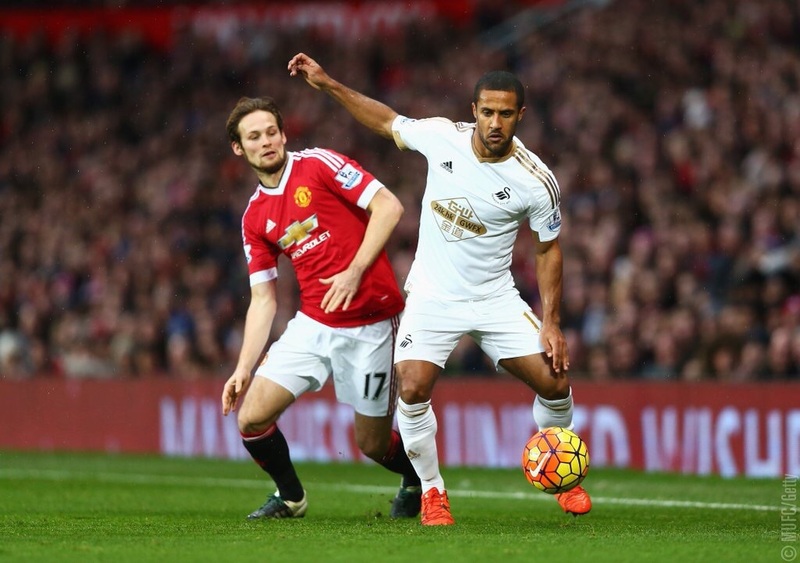 He has been driving at the Swansea defence and has been a goal threat. He's had two enormous chances, both coming from Ashley Young crosses. Hopefully, if he continues as he has been playing, he can snap up a goal in the second half. We've not been playing good attacking football. But one positive is that we are starting to show passion for our club again. Despite the backwards and sideways passing, we're showing a love for our club and intent to win the game. One problem, which I'm sure Van Gaal is discussing in the dressing room, is Ander Herrera giving away free kicks in silly areas. We can see the frustration when he gives away needless free kicks. He just needs to keep more of a calm head and focus on winning the game. Well, if you thought that you were in for a boring second half, you were completely wrong! We finally managed to escape our dreadful win-less streak and won 2-1. 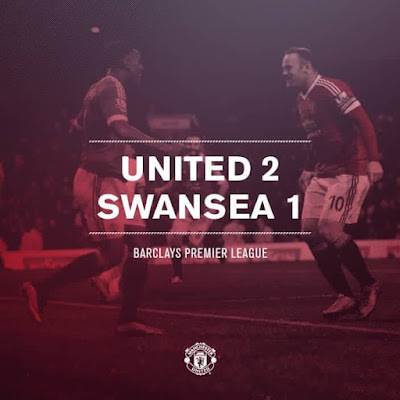 The goals came from Anthony Martial and our skipper, Wayne Rooney. Sigurdsson scored for the Swans. In the first few seconds of the first half, Rooney almost gave us the lead as his shot was deflected behind well by Williams. Things were looking more positive for us. A few seconds later, Anthony Martial managed to get his head on the end of a perfectly driven in ball by Ashley Young. His powerful header gave us the lead that all Manchester United fans had been craving for. The real question though, was whether we could hold onto the lead. In the 69th minute, there was positive play by Martial as he plays a one-two with Rooney before stabbing the shot wide. Moments later, Sigurdsson heads in from Barrow's cross to get the visitors level. 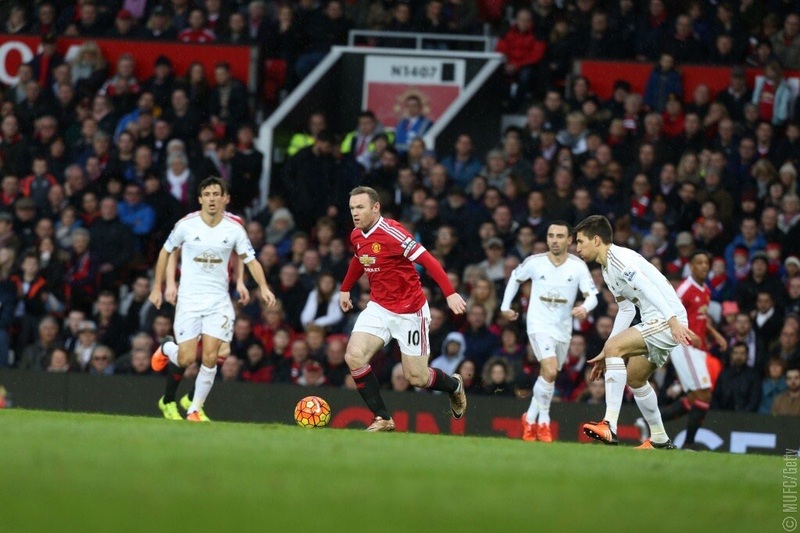 Five minutes later, Anthony Martial powered through the Swansea defence and cut the ball back for Wayne Rooney who scored with a clever flick! Wayne Rooney put us back ahead at Old Trafford. Overall, this wasn't a great performance but it ends out win-less streak and we've won three points. Now onto standout performances, Ashley Young was a stand-out player today. His defending maybe wasn't up to scratch, but his attacking play was formidable. His assist for the first goal showed how perfect his crossing had been throughout the game. Another player who deserves some credit is David De Gea. Despite the fact that he didn't have much to do throughout the game, and he could maybe have done more to avoid conceding the goal, he put in a solid performance. Whenever he was called upon, he was ready and he may well have saved us two points today with those dramatic saves towards the end of the game. 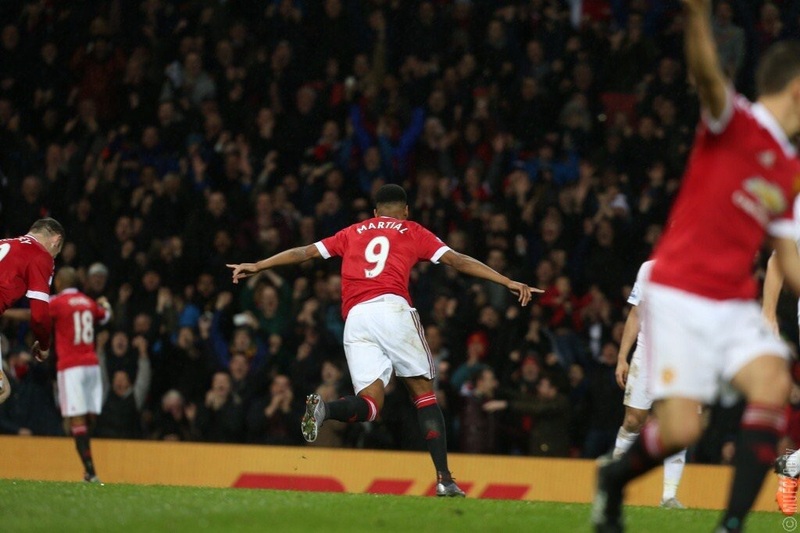 How could we not mention the one and only, Anthony Martial... He was outstanding today! He was influential with his goal and assist and I think it's fair to say that he couldn't have dreamed of a better start to 2016. 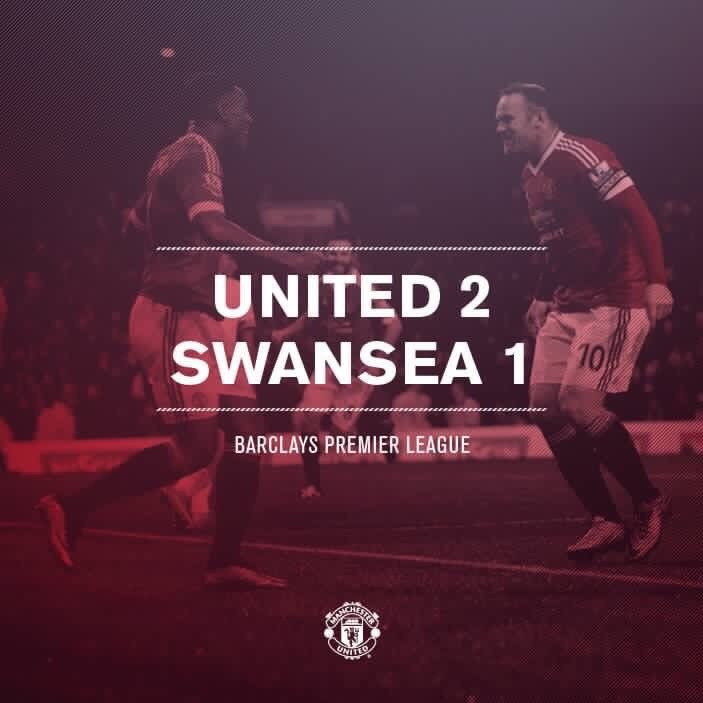 To conclude, finally Manchester United have won a game. We've started 2016 in style!